So i have a new book coming out. 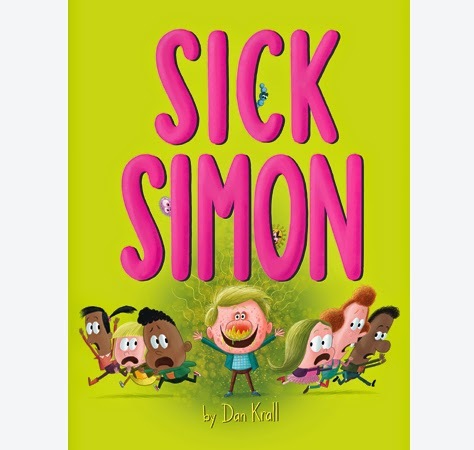 It's called "Sick Simon" and its about a little kid who has a cold and inadvertently spreads it to his family... and dog… and friends... and everyone at school... and Mr. Warbles the class chinchilla...and the bus driver… and the monkeys at the zoo etc.. Some germs see what he's doing and think "hey, he's our kind of guy. We could do great things together!" and try to get Simon to team up with them in infecting the world. Of course I wrote it after our child went to preschool and started bringing home those famous germs and we were all sick for months at a time for the majority of the year. And it's still going on, we're all sick again right now as a matter of fact. 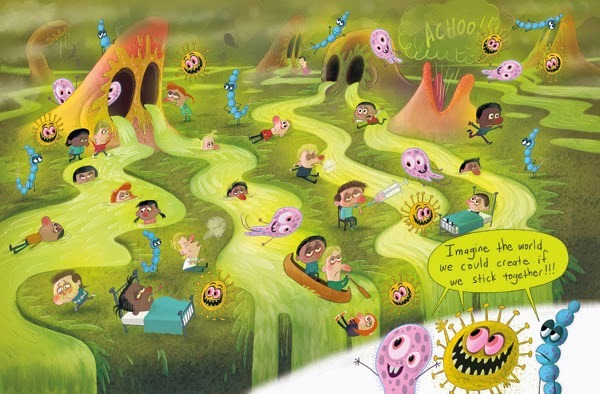 The idea was if I could make a book that could shave off even one day of sickness from what the average household of a toddler or little kid endures by teaching them about germs and how they're spread it would be a huge service to humanity. And that's what I'm all about when I'm not doing naked gnome drawings or drawing screen grabs from Sons of Anarchy. And it totally worked, even though we're all sick again right now, it's been literally months since it last happened and I'm pretty sure it's due to this book. So there you have it, according to me this book cures the common cold. To try to get the word out I'm having a couple of giveaways I'll be hosting on my Facebook Author's Page and my Twitter Feed. You have to go to one of those places and join or follow me to enter. Top 10 Reasons to Buy Sick Simon Giveaway!!! Anyone who shares or retweets one of the postings will be entered to win a free copy of the book and swag (a germ prevention poster and logo tissue packet) and an ink drawing of Sick Simon infecting someone. So without further ado…. The Top 10 Reasons You Should Buy Sick Simon…….. It's got Hieronymus Bosch for Kids!!! I won't be posting the other 9 reasons or more giveaway info here, so if you want to win please follow me on Facebook or Twitter.